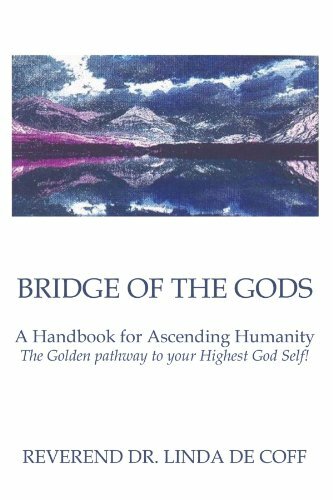 about this book: BRIDGE OF THE GODS takes the reader on a magnificent, soul-advancing journey all the way from "The Awakening ~ Discovering the Bliss of your True Divine Reality" to "The Promised Land", where long held heart's desires are fulfilled through the timeless spiritual techniques, interspersed throughout. BRIDGE OF THE GODS is a culmination of over 30 years of research into Highest Truth and the practices thereof, via the tradiitions of both Eastern and Western metaphysics, from the ancient yogis to The Science of Mind. In it I share some of the profound techniques I have discovered, whereby anyone can overcome obstacles that may have endured even a lifetime long. My whole purpose is to add to the liberation and joy of the reader, freeing the Divine Soul to soar in lustrous victory, once again. Thus the book is dynamic in structure, moving right along up the ladder of mental, emotional, spiritual, and physical transformation into Highest Divine Patterns of being ~ weaving glorious and transcendent stories (both personal and of those I have been privileged to assist in healing), demonstrating the limitless possibilities that truly exist for each and every being. Readers will find themselves effortlessly transformed even while reading, and, if stuckness should arise ~ they will now have ready reference to refer back to. Truth is limitless in scope, so the possibility of greater realization re: any matter of concern, grows deeper with time and practical use. My greatest wish is for all those to read to be newly empowered in the pursuit and Divine manifestation of their most treasured goals ~ freeing from all hindrance of the past, known and unknown. Readers will delight in the soaring meditations at each chapter's end, which provided a grounding of the information gained...and in the absolute knowledge that there is nothing that cannot be healed, by the glory of the Divine Self, already within ~ just awaiting recognition. I also believe strongly in practical "mysticism", so the reader is provided with a rich array of helpful tools, that he/she can always make Divine ideas a living reality, bringing "Heaven" (Highest Consciousness) to "Earth" (everyday conditions ~ from small to large). For, "God would prove us true!" • "Just reading one Chapter can raise one's vibration for an entire day"
• "I was captivated from page One"
— Barry Finlay, Award-winning Author/"Kilimanjaro and Beyond!" • "A True Visionary Masterwork! With each page, the heart beats a bit faster, the mind reaches for clarity, the will aspires to loftier heights."